Japanese whale hunting may have officially been banned, the struggle to save and create awareness depending the future of our oceans is still an ongoing process. Containing 80% of all life on Earth, only 3% of the ocean is protected! On that note, the recently reorganized fashion brand Kenzo announced a partnership with the Blue Marine Foundation to create a collection that campaigns against overfishing and pollution. 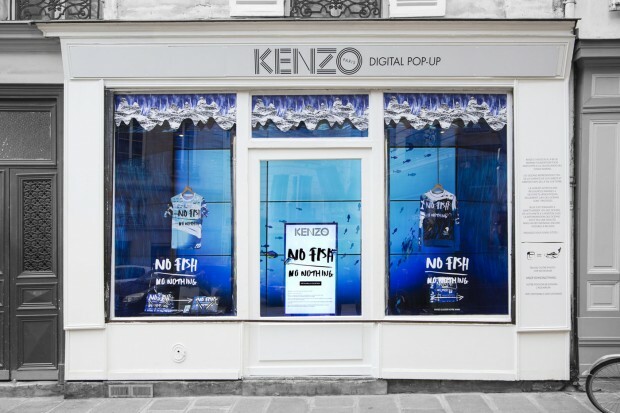 To promote the collection, for one week only, Kenzo opened a digital pop-up store in March, based around a large interactive digital aquarium where shoppers could touch the screens then browse and buy products from the brand’s No Fishing No Nothing collection. Each selection gave birth to a digital fish that enriched the aquarium. Also, Kenzo built a microsite that takes users on a journey of being a fish. The lo-fi interactive Netstalgic website has users click through to ‘swim’ through the ocean as a fish and read facts about overfishing. The new creative directors of Kenzo, Carol Lim and Humberto Leon, both born and raised in California, share a love for the ocean and a sense of responsibility to protect its natural beauty and marine life, making it the natural source of inspiration for their Spring/Summer 14 collection. As fashion is one of the most powerful ways to communicate, the pop-up is a clever way for Kenzo to interact with its customers via social media, by creating a very shareable experience, while also aligning themselves with a cause which may garner them even more fans. ‘No Fish No Nothing’ pieces will be sold in Kenzo stores, online and other participating retailers. To purchase directly from the e-store visit kenzo.com, and be sure to visit bluemarinefoundation.com for more information on their work with Kenzo and around the globe.